The peaceful flicker of the Liberty™ fire is a respite from today’s fast paced environment. 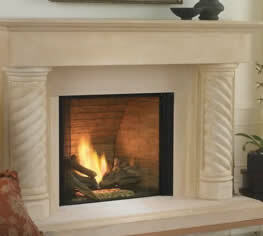 A great fit for any room, the essence of Liberty makes warmth and imagination the focal point in your home. You are in control of your fire ~ both the heat output and your choice of fire stages can be controlled by the Proflame GTM Remote. Pair your choice of brick panels with our oak log set.